Sweeping through Fort McMurray, the wildfire destroyed approximately 2,400 homes and buildings. Another 2,000 residents in three communities were displaced after their homes were declared unsafe for reoccupation due to contamination. The fire continued to spread across northern Alberta and into Saskatchewan, consuming forested areas and impacting Athabasca oil sands operations. With an estimated damage cost of C$9.9 billion, it was the costliest disaster in Canadian history. The fire spread across approximately 590,000 hectares (1,500,000 acres) before it was declared to be under control on July 5, 2016. It continued to smoulder, and was fully extinguished on August 2, 2017. It is suspected to have been caused by humans in a remote area 15 kilometres (9.3 mi) from Fort McMurray, but no official cause has been determined to date. The fire was first spotted by a helicopter forestry crew in a remote area 15 kilometres (9.3 mi) from Fort McMurray on May 1, 2016 and they reported it. First responders arrived 45 minutes later. An official cause of the fire has not been determined to date, but it was suspected to be human caused. 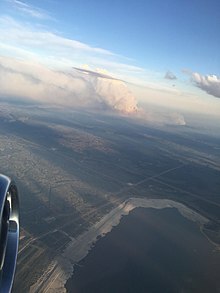 During the start of the fire, an unusually hot, dry air mass was in place over Northern Alberta, which brought record-setting temperatures to Fort McMurray. On May 3, the temperature climbed to 32.8 °C (91 °F), accompanied by relative humidity as low as 12%. The situation intensified on May 4 when temperatures reached 31.9 °C (89 °F) and winds gusted to 72 km/h (45 mph). A natural El Niño cycle also led to a dry fall and winter season along with a warm spring, leaving a paltry snowpack, which melted quickly. Combined with the high temperatures, this created a "perfect storm" of conditions for an explosive wildfire, and significantly contributed to the fire's rapid growth. Climate change was also cited as a potential contributor to the start and spread of the fire. Debate occurred as to whether it was "insensitive" to discuss it during the crisis, or whether the crisis made it "more important" to talk about a correlation between human-influenced climate change and wildfires. Canada's politicians and scientists both cautioned that individual fires cannot specifically be linked to climate change, but agree that it is part of a general trend of more intense wildfires. As the fire spread towards settlements in Fort McMurray, a local state of emergency was declared on May 1 at 9:57 p.m. MDT (03:57 UTC May 2) with the Centennial Trailer Park and the neighbourhoods of Prairie Creek and Gregoire under a mandatory evacuation. The evacuation orders for the two neighbourhoods were reduced to a voluntary stay-in-place order by the night of May 2 as the fire moved southwest and away from the area. The mandatory evacuation order was reinstated and expanded to 12 neighbourhoods on May 3 at 5:00 p.m. (23:00 UTC), and to the entirety of Fort McMurray by 6:49 p.m. (00:49 UTC May 4). A further order covering the nearby communities of Anzac, Gregoire Lake Estates, and Fort McMurray First Nation was issued at 9:50 p.m. on May 4 (03:50 UTC May 5). It has been reported that 88,000 people were successfully evacuated, with no reported fatalities or injuries, but two people, Aaron Hodgson and Emily Ryan, were killed in a vehicular collision during the evacuation, one of whom was the daughter of a firefighter. Despite the mandatory evacuation order, staff at the water treatment plant remained in Fort McMurray to provide firefighters with water. On May 4, the Regional Municipality of Wood Buffalo reported the communities of Beacon Hill, Abasand and Waterways had suffered "serious loss". The Government of Alberta declared a provincial state of emergency, and said 1,600 buildings had been destroyed by the fires. It was estimated that 10,000 hectares (25,000 acres) of land had been burned. Evacuees who travelled north of Fort McMurray were advised to stay where they were, and not to come south on Highway 63 as the fire was still burning out of control. A boil-water advisory was issued for the entire area just after 11 a.m. (17:00 UTC). 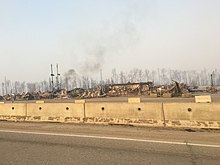 At 4:05 p.m. (22:05 UTC) the fire crossed Highway 63 at Airport Road (formerly Highway 69), south of Fort McMurray, and threatened the international airport, which had suspended commercial operations earlier in the day. The fire also forced the re-location of the Regional Emergency Operations Centre, which was originally in the vicinity of the airport. On May 4, the fire was found to be producing lightning and pyrocumulus clouds due to its heat and large size, which added to the risk of more fires. The fires became large enough to create a firestorm, creating its own weather in the form of wind influxes and lightning. The fire continued to spread south on May 5 across 85,000 hectares (210,000 acres) and forcing additional evacuations in the communities of Anzac, Gregoire Lake Estates and the Fort McMurray First Nation. These communities had accepted over 8,000 people during the initial evacuations. The Government of Alberta announced a plan to airlift approximately 8,000 of 25,000 people who had evacuated to oil sands work camps north of Fort McMurray, with assistance from a Royal Canadian Air Force Hercules aircraft, and other planes owned by energy companies operating in the oil sands. 1,110 personnel, 145 helicopters, 138 pieces of heavy equipment and 22 air tankers were employed to fight the fire. On May 6, the Royal Canadian Mounted Police began leading convoys to move 1,500 vehicles from oil sand work camps north of Fort McMurray, south along Highway 63 to Edmonton. The fire continued to grow out of control, spreading to 100,000 hectares (250,000 acres) by May 6, and 200,000 hectares (490,000 acres) by May 7. As the fire grew to the northeast, the community of Fort McKay, which hosted 5,000 evacuees from Fort McMurray, was itself put under an evacuation notice. Albertan officials anticipated that the fire would double in size, and reach the Saskatchewan border to the east. The wildfire continued to spread through remote forested areas in the following week, reaching oilsand work camps south of Fort MacKay, forcing the evacuation of 19 oil sites and camps with approximately 8,000 workers. One lodge with 665 units was destroyed. The fire continued to grow, from 285,000 hectares (700,000 acres) on May 16 to 504,443 hectares (1,246,510 acres) on May 21 and even spread across 741 hectares (1,830 acres) in Saskatchewan. While the fire moved away from Fort McMurray, two explosions and poor air quality continued to prevent residents and rebuilding crews from returning to the town. By May 18, the fire had grown to 423,000 hectares (1,050,000 acres) and expanded into Saskatchewan. By mid-June, rain and cooler temperatures helped firefighters contain the fire, and on July 4, 2016, the fire was declared under control. The wildfire was still considered to be active over the following year, having smouldered in deeper layers of moss and dirt throughout the winter. On August 2, 2017, with no further outbreaks or detection of hot spots by thermal surveys conducted over the summer, provincial officials declared the wildfire extinguished. The Government of Alberta declared a provincial state of emergency for Fort McMurray on May 4, 2016, and issued a formal request for assistance from the Canadian Armed Forces. The government and the Department of National Defence signed a memorandum of understanding on May 4, detailing required assistance and use of helicopters for rescue operations. Shortly after, a CC-130 Hercules departed CFB Trenton and helicopters were dispatched to the affected area. Alberta also requested assistance from the Government of Ontario, and Ontario committed to sending 100 firefighters and 19 supervisory staff, coordinated through the Canadian Interagency Forest Fire Centre. Other provinces across the country offered support. On May 5, four CL-415 water bombers from Quebec's Service aérien gouvernemental (fr) took off from the province to aid in the firefighting effort. Approximately 300 Royal Canadian Mounted Police officers provided security in the wildfire area. South Africa sent 301 firefighters at the request of the Canadian Interagency Forest Fire Centre at the end of May. The firefighters were trained during the month of April at a boot camp, in order how to learn to use special hoses instead of the leather-padded wooden sticks known as "firebeaters" they typically use in their home country due to a lack of water. Less than a week after being deployed, the South Africans went on strike over a wage dispute and were demobilized. Alberta Premier Rachel Notley vowed to address the issue and ensure that the firefighters were paid a minimum of C$11.20 per hour as required by the province's labour laws, rather than the C$15 per day allowance specified in their contract with their South African employer. The Alberta government provided an initial $1,250 per adult and $500 per dependent to cover living expenses for those who had evacuated. On May 4, the provincial government committed to match donations made to the Canadian Red Cross, as well as to donate an additional $2 million as seed money; the federal government pledged to match all donations to the Canadian Red Cross the next day, with a deadline set to May 31. As of May 9[update], $54 million has been donated to the Red Cross, not including matching government contributions. On May 4, Public Safety Canada activated the International Charter Space and Major Disasters, thus providing for the charitable and humanitarian re-tasking of the diverse satellite assets of 15 space agencies. Later, Edmonton's Capital Region Housing Corporation (CRHC), along with the City of Edmonton, the Alberta Residential Landlord Association, and Yardi Canada Ltd., announced a partnership to create a registry of rental properties for Fort McMurray evacuees. The non-profit initiative would offer this service free of charge to landlords for the next six months. Some landlords had offered incentives to wildfire evacuees, including reduced security deposits, reduced rent, or free rent for a month or more. Prime Minister Justin Trudeau visited Fort McMurray on May 13 to survey the damage and promised ongoing aid from the federal government in the coming months. The Governor General, David Johnston, and Sophie, Countess of Wessex, met with first responders and visited the ruins of the Beacon Hill neighbourhood of Fort McMurray on June 24, 2016. The Alberta government was criticized for cutting $15 million from the province's wildfire suppression budget in April 2016, just prior to the outbreak of the wildfire. While Premier Rachel Notley contended that wildfires were paid by emergency funds that would not be limited to combat a wildfire, local air tanker companies argued that the cuts created a personnel issue, and would make it more difficult to keep staff on duty during the wildfire season. Cuts were also made to fire preparation budgets, which funded activities such as creating fire breaks, but it is not certain that those activities would have been beneficial against a wildfire powerful enough to traverse the Athabasca River. The federal government was criticized after international assistance from Australia, Israel, Mexico, the Palestinian Authority, Russia, Taiwan, and the United States was offered in battling the fire, and turned down by Prime Minister Justin Trudeau. Russia specifically offered Ilyushin Il-76 firefighting aircraft that could handle up to 42 tons of fire suppression at one time. Trudeau said that while the offers were appreciated, they were unnecessary as firefighters from other Canadian provinces were gaining control of the situation. Trudeau was also criticized on May 6, 2016 for not visiting Fort McMurray and showing support, less than a week after the fire started. Trudeau responded that "showing up in Fort McMurray, when firefighters are busy trying to contain a massive raging wildfire, is not a particularly helpful thing," and comparisons were drawn to former Prime Minister Stephen Harper's visit to Kelowna, British Columbia the previous year. Trudeau visited Fort McMurray a week later on May 13, 2016. Initial estimates from May 4 indicated that 1,600 structures in Fort McMurray were destroyed. Firefighters worked through May 6 and 7 to hold the line and protect the downtown and remaining homes in Fort McMurray. On May 9, this figure was revised to 2,400 structures, and about 85 to 90% of the community was reported undamaged. Overnight on May 16–17, two explosions occurred in the Thickwood and Dickensfield neighbourhoods, damaging 10 buildings and destroying three. The town's power grid sustained damage. Almost the entire Fort McMurray area was placed under a boil-water advisory during the fire, since untreated water was placed into the municipal water system to supply firefighters. The boil water advisory was lifted in all areas of Fort McMurray on August 17, 2016. Statistics Canada suspended enumeration activities for the 2016 Census in the Fort McMurray area on May 5. Alternative means to collect data from its residents were to be determined at a later date. Some census data was received early, and some residents sent their census data online after the evacuation. Statistics Canada was able to create an accurate 2016 census profile for Fort McMurray using this information, as well as Canada Revenue Agency income tax records, local birth and death records, and long-form census information collected by surveyors going door to door. The neighbourhoods of Waterways, Abasand, and Beacon Hill after being severely burned were then declared unsafe for reoccupation, due to contamination from arsenic and heavy metals. These neighbourhoods also do not have water service due to damages to the water system. Satellite images of the fire at day (May 3, 2016) overnight (May 5, 2016), and its smoke impacts across North America. The wildfire halted oil sands production at facilities north of Fort McMurray. Shell Canada shut down output at its Albian Sands mining operation, located approximately 70 km (43 mi) north of Fort McMurray. The company said its priority was to get employees and their families out of the region, and provide capacity at its work camp for some of the evacuees. Shell also provided its landing strip to fly employees and their families to Calgary or Edmonton and provided two teams to support firefighting efforts in the area. Suncor Energy and Syncrude Canada also scaled back operations. Suncor's Millennium and North Steepbank mines were two of the largest and oldest oilsands mining operations in the Fort McMurray area, and Syncrude's Mildred Lake oilsands mine is located 35 km (22 mi) north of Fort McMurray. The companies accommodated another 2,000 evacuees each at their work camps. On May 7, Syncrude shut down all site and processing operations, removing 4,800 employees from the area. On May 16, all 665 rooms at Blacksands Executive Lodge, a work camp, burned in the wildfire. Earlier that day, about 8,000 people were ordered out of 19 camps; about 6,000 remained. By May 17, the fire appeared to reach the Noralta Lodge, a few kilometres east of Blacksands. Approximately one million barrels of oil a day, equal to a quarter of Canada's oil production, was halted as a result of the fire in May 2016. This continued into June at a rate of 700,000 barrels per day. The lost output was estimated to cost the Albertan economy $70 million per day, and was a contributing factor to rises in global oil prices. The scaled back operations, along with a refinery outage in Edmonton, caused many gas stations to run out of gas throughout Western Canada. Oil companies restored production and anticipated all financial impacts would wear off by the end of the third fiscal quarter. Initial insurance payouts were estimated to total as much as C$9 billion if the entire community had to be rebuilt. 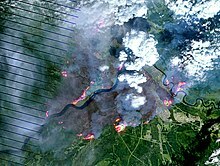 By July 7, 2016, the Insurance Bureau of Canada (IBC) and Catastrophe Indices and Quantification Inc. (CatIQ) reported that insured damage was estimated to have reached $3.58 billion, making the wildfire the most expensive disaster in Canadian history, surpassing the 1998 ice storms in Quebec ($1.9 billion) and the 2013 Alberta floods ($1.8 billion). The 2011 Slave Lake Wildfire, which destroyed one-third of the town of Slave Lake, cost approximately $750 million and was the most expensive fire-related disaster in Canadian history. The larger damage estimates were a result of Fort McMurray being 10 times the size of Slave Lake. A further estimate based on current damage estimated insurance payouts reaching as high as $4.7 billion. Essential services such as emergency services, transportation, utilities and essential businesses can be re-established, as well as the infrastructure that supports these services. Residents were allowed to re-enter Fort McMurray and surrounding communities according to a schedule broken down into residential zones. The neighbourhoods of Waterways, Abasand, and Beacon Hill were severely burned, and were declared unsafe for reoccupation due to contamination from arsenic and heavy metals from leftover ash. 2,000 residents in these neighbourhoods were only allowed supervised visits to their homes, and relied on workers from a not-for-profit organization made up of former or current Canadian and U.S. Armed Forces members to sift through leftover items. Between, August 31 and October 24, 2016, residents of 470 homes within the three neighbourhoods were able to move home. In the wake of the wildfire impact on Fort McMurray, the Regional Municipality of Wood Buffalo created a wildfire recovery plan, establishing a framework and governance structure for recovery efforts. Recovery funding was estimated to be above $4.5 billion: $615 million from federal, provincial and municipal governments; $319 million from the Canadian Red Cross; and $3.58 billion from the insurance industry. As of January 2018, 90% of wildfire claims have been processed according to the Insurance Bureau of Canada. Reconstruction of impacted communities is ongoing, and as of May 2018, 20% of the homes destroyed have been rebuilt. The Regional Municipality of Wood Buffalo updated their Wildfire Mitigation Strategy in January 2018, which conducted a risk assessment for wildfire behaviour. It also proposed clearing 867 hectares of vegetation, various access and safety standards for planned infrastructure and land development, educating members of the public on wildfire threats, cooperation and joint training between the municipal and provincial departments, and updates to emergency plans. The Regional Municipality of Wood Buffalo also raised awareness about rebuilding homes to ensure they are more resilient to fire. However, insurance companies only provide funds to restore pre-fire conditions, and an independent review by KPMG found that it was unlikely that this would occur. ^ "A Week in Hell – How Fort McMurray Burned". The Globe & Mail. May 7, 2016. Archived from the original on August 16, 2016. Retrieved May 8, 2016. ^ "The Beast is alive: How the fire that tried to destroy Fort McMurray is still burning near the Saskatchewan border". National Post. November 4, 2016. Retrieved November 4, 2016. ^ Weber, Bob (January 17, 2017). "Costs of Alberta wildfire reach $9.5 billion: Study". BNN Canada. Archived from the original on January 19, 2017. Retrieved January 18, 2017. ^ "Fort McMurray 2016 Wildfire - Economic Impact" (PDF). Statistics Canada. Archived (PDF) from the original on July 20, 2018. Retrieved July 20, 2016. ^ a b Romero, Diego (July 7, 2016). "Fort McMurray wildfires damage cost $3.85 billion". CTV. Edmonton. Archived from the original on July 8, 2016. Retrieved July 7, 2016. ^ a b "It's official – Fort McMurray wildfire finally out". Global News. September 1, 2017. Archived from the original on September 1, 2017. Retrieved September 1, 2017. ^ a b c Barkto, Karen (May 4, 2016). "Fort McMurray wildfire update: Roughly 1600 buildings destroyed in 'catastrophic' fire". Global News. Archived from the original on May 4, 2016. Retrieved May 4, 2016. ^ "Alberta government lifts state of emergency issued over Fort McMurray fire". CTV News. July 1, 2016. Archived from the original on February 2, 2017. Retrieved January 21, 2017. ^ a b "Fort McMurray wildfire now considered under control". CBC News. July 5, 2016. Archived from the original on July 8, 2016. Retrieved July 5, 2016. ^ a b c "Home Again: Recovery after the Wood Buffalo Wildfire" (PDF). Government of Alberta. pp. 13–16. Archived (PDF) from the original on January 31, 2017. Retrieved March 26, 2018. ^ a b c "Fort McMurray fire sweeps east through northern oilsands sites". CBC News. May 17, 2016. Archived from the original on May 17, 2016. Retrieved May 17, 2016. ^ a b c d Regional Municipality of Wood Buffalo [@RMWoodBuffalo] (May 4, 2016). "We have successfully evacuated 88,000 people with no reports of injuries or casualties so far #ymmfire" (Tweet). Retrieved May 4, 2016 – via Twitter. ^ Lamoureux, Mack (May 6, 2016). "'Tragedy, layered on tragedy': Girl, 15, killed in Fort McMurray evacuation". CBC News. Archived from the original on May 15, 2016. Retrieved May 16, 2016. ^ Parsons, Paige (May 19, 2016). "Fort McMurray fire grows to 505,000 hectares as it crosses into Saskatchewan". Edmomton Journal. Archived from the original on May 19, 2016. Retrieved May 19, 2016. ^ a b c d e Edwards, Peter (May 5, 2016). "Alberta issues province-wide fire ban as crews battle flames in Fort McMurray". Toronto Star. Archived from the original on May 6, 2016. Retrieved May 5, 2016. ^ "A timeline of the Fort McMurray wildfire, Canada's news story of 2016". City News. Retrieved January 12, 2019. ^ "Fort McMurray wildfire "most likely" result of human activity: RCMP". CTV. June 15, 2016. Archived from the original on June 15, 2016. Retrieved June 15, 2016. ^ a b "Daily Data Report for May 2016". Environment Canada. May 6, 2016. Archived from the original on June 10, 2016. Retrieved May 6, 2016. ^ "Hourly Data Report for May 03, 2016". Environment Canada. May 6, 2016. Archived from the original on June 10, 2016. Retrieved May 6, 2016. ^ "Daily Data Report for May 2016". Environment Canada. May 6, 2016. Archived from the original on June 10, 2016. Retrieved May 6, 2016. ^ McGrath, Matt (May 5, 2016). "'Perfect storm' of El Niño and warming boosted Alberta fires". BBC News. BBC. Archived from the original on May 7, 2016. Retrieved May 7, 2016. ^ Kahn, Brian (May 4, 2016). "Here's the Climate Context For the Fort McMurray Wildfire". Climate Central. Archived from the original on May 7, 2016. Retrieved May 7, 2016. ^ Sullivan, Brian K. (May 5, 2016). "El Nino Added to Alberta's Fire Woes Before Fort McMurray Burned". Bloomberg News. Archived from the original on May 3, 2017. Retrieved March 4, 2017. ^ a b c Parsons, Paige (May 3, 2016). "Thousands flee from Fort McMurray wildfire in the largest fire evacuation in Alberta's history". Edmonton Journal. Postmedia Network. Archived from the original on May 10, 2016. Retrieved May 3, 2016. ^ Holthaus, Eric (May 6, 2016). "We Need to Talk About Climate Change". Slate. Archived from the original on June 4, 2016. Retrieved May 7, 2016. ^ Tasker, John (May 4, 2016). "'Of course' Fort McMurray fire linked to climate change, Elizabeth May says". CBC News. Archived from the original on May 7, 2016. Retrieved May 7, 2016. ^ Snowdon, William (May 2, 2016). "Fort McMurray braces for high winds in battle with wildfire". CBC News Edmonton. Archived from the original on May 10, 2016. Retrieved May 3, 2016. ^ McDermot, Vincent; French, Janet (May 2, 2016). "Wildfire continues to threaten Fort McMurray neighbourhood". Edmonton Journal. Archived from the original on May 10, 2016. Retrieved May 3, 2016. ^ McDermot, Vincent; Bird, Cullen (May 2, 2016). "'A great day for us': Wildfire moves away from Fort McMurray as crews fight blaze". Fort McMurray Today. Archived from the original on May 3, 2016. Retrieved May 3, 2016. ^ Ivanov, Jennifer; Bartko, Karen; Heidenreich, Phil (May 3, 2016). "'We are in for a rough day': Fort McMurray wildfire expected to flare up Tuesday afternoon". Global News. Archived from the original on May 3, 2016. Retrieved May 4, 2016. ^ "Wildfire destroys Fort McMurray homes, most of city evacuated". CBC News Edmonton. May 3, 2016. Archived from the original on May 4, 2016. Retrieved May 3, 2016. ^ "Municipality Announces Mandatory Evacuations for Anzac, Gregoire Lake Estates and Fort McMurray First Nation". Regional Municipality of Wood Buffalo. May 4, 2016. Archived from the original on May 5, 2016. Retrieved May 5, 2016. ^ "2 die in fiery crash on Highway 881 south of Fort McMurray". CBC News. May 4, 2016. Archived from the original on May 5, 2016. Retrieved May 4, 2016. ^ Thurton, David (January 2, 2017). "Park planned in memory of girl who died during Fort McMurray wildfire evacuation". CBC News. Archived from the original on June 27, 2017. Retrieved May 14, 2017. ^ a b Stewart, Briar; Reith, Terry (June 6, 2016). "Fort McMurray's water warrior fought to keep the flow to firefighters going". CBC News. Archived from the original on June 6, 2016. Retrieved June 6, 2016. ^ French, Janet (May 9, 2016). "A timeline of the Fort McMurray wildfire". Edmonton Journal. Archived from the original on June 8, 2016. Retrieved November 2, 2018. ^ a b "Fort McMurray Wildfire Updates". Regional Municipality of Wood Buffalo. May 7, 2016. Archived from the original on May 7, 2016. Retrieved May 7, 2016. ^ McConnell, Rick (May 4, 2016). "'Catastrophic' Fort McMurray wildfire prompts state of emergency". CBC News. Archived from the original on May 5, 2016. Retrieved May 4, 2016. ^ a b "Fort McMurray evacuees flee again as fire spreads: 'It's almost like it's following us'". National Post. May 5, 2016. Archived from the original on May 7, 2016. Retrieved May 5, 2016. ^ Jones Judson; Miller Branson (May 6, 2016). "How wildfires create towering pyrocumulus clouds". Cable News Network. Turner Broadcasting System, Inc. CNN. Archived from the original on May 7, 2016. Retrieved May 8, 2016. ^ Zairah Khurshid. "Canada fire: Fort McMurray resident calls the Alberta firestorm 'Armageddon'". International Business Times UK. Archived from the original on May 9, 2016. Retrieved May 8, 2016. ^ a b "Update 2: Fort McMurray Wildfire (May 5 at 10 am)". Government of Alberta. May 5, 2016. Archived from the original on May 6, 2016. Retrieved May 5, 2016. ^ "People who fled Fort McMurray wildfire now evacuated from Anzac after blaze moves south". Edmonton Journal. May 4, 2016. Archived from the original on March 17, 2018. Retrieved November 2, 2018. ^ a b "'The beast is still up': Wildfire evacuees stuck north of Fort McMurray moving south in massive RCMP convoy". National Post. May 6, 2016. Archived from the original on May 7, 2016. Retrieved May 6, 2016. ^ "Fort McMurray wildfire continues to grow out of control". News 1130. May 6, 2016. Archived from the original on May 7, 2016. Retrieved May 6, 2016. ^ Ramsay, Caley (May 8, 2016). "Fort McMurray wildfire reaches 200,000 hectares in size, expected to continue to grow". Global News. Archived from the original on September 15, 2018. Retrieved November 2, 2018. ^ Bird, Cullen (May 7, 2016). "Fort McKay under voluntary evacuation order as wildfire size expected to double". Postmedia Network. Fort McMurray Today. Archived from the original on May 8, 2016. Retrieved May 7, 2016. ^ "Fort McKay First Nation welcomed 5,000 people at wildfire evacuation's peak". Aboriginal Peoples Television Network. Aboriginal Peoples Television Network. May 7, 2016. Archived from the original on June 2, 2016. Retrieved May 7, 2016. ^ a b "Canadian wildfire shifts north, prolonging oil sands shutdown". Reuters Canada. May 17, 2016. Archived from the original on June 10, 2016. Retrieved May 17, 2016. ^ "Fort McMurray announces re-entry schedule, evacuation lifted on some oilsands camps". CBC/Radio Canada. CBC News Edmonton. May 21, 2016. Archived from the original on May 21, 2016. Retrieved May 22, 2016. ^ "Wildfire heads towards oil plants as explosions hit Fort McMurray sites". Toronto Star. May 17, 2016. Archived from the original on May 18, 2016. Retrieved May 17, 2016. ^ "Fort McMurray fire grows to 423,000 hectares, continues to threaten oilsands sites". CBC News. May 18, 2016. Archived from the original on May 18, 2016. Retrieved May 18, 2016. ^ "Canadian Wildland Fire Information System". Natural Resources Canada. May 18, 2016. Archived from the original on June 11, 2016. Retrieved May 19, 2016. ^ Snowdon, Wallis (June 13, 2016). "Fort McMurray fire largely contained thanks to rain, firefighters' efforts". CBC News. Archived from the original on June 13, 2016. Retrieved June 13, 2016. ^ McDermott, Vincent (October 27, 2016). "Fort McMurray wildfire under control, but will smoulder underground during the winter". Sun Media Community Newspapers. Fort McMurray Today. Archived from the original on October 28, 2016. Retrieved November 5, 2016. ^ Quinlan, Peter (December 20, 2016). "'The Beast' is still burning east of Fort McMurray". Global News. Archived from the original on December 21, 2016. Retrieved December 20, 2016. ^ Dehaas, Josh (May 4, 2016). "Fort McMurray fire: State of emergency declared". CTV News. Archived from the original on May 6, 2016. Retrieved May 4, 2016. ^ "Military air assets preparing to head to Fort McMurray: source". iPolitics. May 5, 2016. Archived from the original on May 6, 2016. Retrieved May 4, 2016. ^ a b Mas, Susana (May 4, 2016). "Trudeau says Canadians are united around Fort McMurray as federal response gets underway". CBC News. Archived from the original on May 4, 2016. Retrieved May 4, 2016. ^ "Ontario sending 100 firefighters to help fight Fort McMurray fire". CBC News. May 4, 2016. Retrieved November 2, 2018. ^ "Four water bombers heading to Alberta" (in French). Radio-Canada. May 5, 2016. Archived from the original on May 6, 2016. Retrieved May 5, 2016. ^ "Fort McMurray wildfire: Mounties secure city, prevent intruders from entering". Global News. May 16, 2016. Archived from the original on May 28, 2017. Retrieved July 20, 2017. ^ "South African firefighters prep for Canada in their biggest international deployment yet". Times Live. May 26, 2016. Archived from the original on August 21, 2016. Retrieved June 2, 2016. ^ York, Geoffrey (May 28, 2016). "300 South African firefighters are trained and headed to Fort McMurray". The Globe and Mail. Archived from the original on June 2, 2016. Retrieved June 2, 2016. ^ "Notley says South African firefighters' low wages are 'not acceptable'". The Globe and Mail. May 30, 2016. Archived from the original on April 5, 2017. Retrieved June 10, 2016. ^ "Here's our list of resources for Fort McMurray wildfire evacuees and how you can help". Edmonton Journal. May 7, 2016. Archived from the original on May 7, 2016. Retrieved May 7, 2016. ^ "Alberta Government matching Red Cross donations for Fort McMurray". Alberta.ca. Alberta Government. Archived from the original on May 5, 2016. Retrieved May 5, 2016. ^ "Fort McMurray relief donations hit $54M: Red Cross". CTV News. May 9, 2016. Archived from the original on May 10, 2016. Retrieved May 10, 2016. ^ "Latest Activation: Fire in Canada". International Charter Space and Major Disasters. May 4, 2016. Archived from the original on June 3, 2016. Retrieved May 6, 2016. ^ Neufield, Lydia (May 16, 2016). "New housing registry opens for Fort McMurray evacuees". CBC News. Archived from the original on May 18, 2016. Retrieved May 20, 2016. ^ Ramsay, Caley (May 16, 2016). "Edmonton launches online housing registry for Fort McMurray wildfire evacuees". Global News. Archived from the original on May 19, 2016. Retrieved May 20, 2016. ^ "Justin Trudeau taking aerial tour of Fort McMurray". The Toronto Star. May 13, 2016. Archived from the original on May 14, 2016. Retrieved May 13, 2016. ^ Ellwand, Otiena (May 14, 2016). "Justin Trudeau says Canadians have yet to grasp the 'amazing' work that saved Fort McMurray". Edmonton Journal. Archived from the original on May 15, 2016. Retrieved May 15, 2016. ^ The Canadian Press (June 23, 2016). "Countess of Wessex, Governor General to visit Fort McMurray". The Globe and Mail. Archived from the original on June 24, 2016. Retrieved June 24, 2016. ^ a b c "Debunking the Fort McMurray rumours: No, the fire wasn't started by ISIL, eco-terrorists or Rachel Notley". National Post. May 10, 2016. Retrieved July 31, 2018. ^ "Wildfire suppression budget cuts could endanger province, says air tanker company". CBC News. April 19, 2016. Archived from the original on December 28, 2016. Retrieved July 31, 2018. ^ "Russian offer to send water bombers to fight Fort McMurray fire in limbo". CBC. May 8, 2016. Archived from the original on May 9, 2016. Retrieved May 8, 2016. ^ "Justin Trudeau turns down Russian, U.S., Mexican offers to help fight Fort Mac wildfire". National Post. May 9, 2016. Archived from the original on May 9, 2016. Retrieved May 9, 2016. ^ "Fort McMurray Fire: Trudeau Says Now Is Not The Time To Visit Alberta City". Huffington Post. May 6, 2016. Archived from the original on July 31, 2018. Retrieved July 31, 2018. ^ "Fort McMurray wildfire: Justin Trudeau gets first-hand look at devastation". Global News. May 13, 2016. Archived from the original on July 31, 2018. Retrieved July 31, 2018. ^ a b "Growing Fort McMurray wildfire could double in size and reach Saskatchewan border". National Post. May 7, 2016. Archived from the original on May 8, 2016. Retrieved May 7, 2016. ^ McConnell, Rick (May 9, 2016). "Fort McMurray is 'still alive,' fire chief says – but safety concerns linger". CBC News. Archived from the original on May 9, 2016. Retrieved May 10, 2016. ^ Johnston, Scott (May 17, 2016). "UPDATED – Explosions damage and destroy Fort McMurray homes". Corus Entertainment Inc. Archived from the original on May 18, 2016. Retrieved May 19, 2016. ^ a b "RMWB Wildfire Recovery Information: Boil-Water Advisory Status". Regional Municipality of Wood Buffalo. Archived from the original on August 14, 2016. Retrieved August 12, 2016. ^ "Statistics Canada suspends Census collection in Fort McMurray area". Statistics Canada. May 5, 2016. Archived from the original on May 8, 2016. Retrieved May 6, 2016. ^ "StatsCan confident in pre-fire Fort McMurray population count". Edmonton Sun. February 8, 2017. Archived from the original on September 13, 2018. Retrieved September 13, 2018. ^ a b "Hundreds of undamaged Fort McMurray homes declared unsafe due to toxic ash". CBC News. May 30, 2016. Archived from the original on May 30, 2016. Retrieved May 30, 2016. ^ a b Mertz, Emily; Kornik, Slav (June 3, 2016). "Visits to 3 restricted Fort McMurray neighbourhoods to begin June 8". Global News Edmonton. Archived from the original on June 10, 2016. Retrieved June 11, 2016. ^ a b "Wildfire forces heart of Canada's oilsands to scale back production". Montreal Gazette. May 3, 2016. Archived from the original on May 5, 2016. Retrieved May 5, 2016. ^ "Syncrude Canada oil sands operation shut down, staff removed, due to Fort McMurray fire". The Globe and Mail. May 7, 2016. Archived from the original on May 10, 2016. Retrieved November 2, 2018. ^ "Fort McMurray fire sweeps east through northern oilsands sites". CBC/Radio-Canada. CBC News. May 17, 2016. Archived from the original on May 18, 2016. Retrieved May 19, 2016. ^ Jones, Jeffrey (May 7, 2016). "Syncrude Canada oil sands operation shut down, staff removed, due to Fort McMurray fire". The Globe and Mail. Archived from the original on May 10, 2016. Retrieved May 7, 2016. ^ a b The Canadian Press (October 26, 2016). "Back-to-business results expected from oilsands as wildfire impact dissipates". CFJC Today. Archived from the original on March 29, 2018. Retrieved June 20, 2016. ^ Weld, Carmen (June 7, 2016). "Don't panic, there is gas". Castanet. Archived from the original on June 21, 2016. Retrieved June 20, 2016. ^ a b c "Fort McMurray fire could cost insurers $9B, BMO predicts". CBC News. May 5, 2016. Archived from the original on May 10, 2016. Retrieved May 5, 2016. ^ a b "Northern Alberta Wildfire Costliest Insured Natural Disaster in Canadian History - Estimate of insured losses: $3.58 billion". Insurance Bureau of Canada. July 7, 2016. Archived from the original on February 23, 2017. Retrieved February 22, 2017. ^ "Insurance losses from Fort McMurray fire could top $9 billion, analyst says". Edmonton Journal. May 5, 2016. Archived from the original on May 6, 2016. Retrieved May 5, 2016. ^ "Phased re-entry into Fort McMurray expected to start June 1". Government of Alberta. May 18, 2016. Archived from the original on May 21, 2016. Retrieved May 21, 2016. ^ McConnell, Rick (May 19, 2016). "As smoke drifts away, Fort McMurray hard at work on re-entry plans". CBC News. Archived from the original on May 21, 2016. Retrieved May 21, 2016. ^ Markusoff, Jason (May 18, 2016). "Re-entry day: What Fort McMurray will look like on June 1". Maclean's. Archived from the original on May 21, 2016. Retrieved May 21, 2016. ^ "Conditional re-entry timeline". Alberta. Government of Alberta. May 27, 2016. Archived from the original on May 27, 2016. Retrieved May 28, 2016. ^ "Regional Municipality of Wood Buffalo 2016 Wildfire Recovery Plan" (PDF). Regional Municipality of Wood Buffalo. p. 38. Archived (PDF) from the original on December 21, 2016. Retrieved December 20, 2016. ^ a b Kraus, Sarah (January 31, 2018). "Fort McMurray wildfire rebuild making progress, mayor says". Global News. Archived from the original on March 28, 2018. Retrieved March 28, 2018. ^ "Two years later: 20 per cent of homes lost during Fort McMurray wildfires fully rebuilt". CTV News. May 3, 2018. Archived from the original on November 3, 2018. Retrieved November 2, 2018. ^ "Regional Municipality of Wood Buffalo Wildfire Mitigation Strategy". Regional Municipality of Wood Buffalo. December 2017. Archived from the original on February 1, 2018. Retrieved March 28, 2018. ^ Firby, Doug (January 7, 2017). "Don't just rebuild houses, build 'em better". Battlefords News-Optimist. Archived from the original on November 4, 2018. Retrieved November 2, 2018. ^ Insurance Bureau of Canada. "Ask Your Builder...Build Back Better" (PDF). Regional Municipality of Wood Buffalo. Archived (PDF) from the original on July 17, 2017. Retrieved November 2, 2018. ^ Tait, Carrie (July 27, 2017). "Fort McMurray rebuild happening too quickly and cheaply, review finds". The Globe and Mail. Archived from the original on July 28, 2017. Retrieved July 28, 2017. 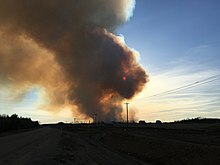 Wikimedia Commons has media related to 2016 Fort McMurray wildfire. MecElhatton, Heather, "Volunteer Truckers Help Save Burning Canadian Town", A Beautiful World. Minnesota Public Radio. Story of volunteer truckers delivering food, fuel, and supplies to firefighters and stranded motorists.